With every year there comes change, improvement and trends to access. At DiSabatino Landscaping we are always looking to learn new things and explore our creativity in order to deliver the best landscaping product or service to our clientele. With that in mind, we’ve come up with a list of landscaping and outdoor living trends to look out for and consider this year. 1) Younger customers: As I get older, everyone else starts to look younger. Over my many years in the landscaping business, I have notice that we are getting a large amount of millennials contacting us for major landscaping and hardscaping projects. 2) Integrating technology: Landscaping companies are utilizing all sorts of technology to the benefit of their clientele. Whether it is the use of a drafting program during the design and build stage, retractable awnings or solar powered lighting; expect increased integration of technology. 3) Battery-powered equipment: Cordless-electric outdoor power equipment has gained more power and dependability to the point that is becoming a formidable competitor of gas-powered equipment. Keep in mind when purchasing several pieces of battery operated lawn tools that it might make sense to stick with the same brand so you can use the same battery for several different pieces of equipment. 4) Low-maintenance landscapes: People are working longer hours and looking for ways to cut back on home and outdoor maintenance. Low-maintenance plantings, cutting back on the amount of grass you must mow and installing automatic irrigation systems are just a few of the low-maintenance landscaping strategies you can take to lessen your workload. 5) Pollinator gardens: Many gardeners are stepping up to the plate to protect our native bee species whose population has greatly declined due to pesticides, habitat loss or other ecological changes. Create pollinator gardens with the best bee plants and nesting habitats according to the particular native species you are trying to help. 6) Asymmetrical design: Abstract landscaping or asymmetrical design is key to creating landscaping results that are pleasing, artistic and free form. This gives a more natural and relaxed impression that is less dependent on the shape of your garden and more concentrated on creating unity through the use of a variety of elements such as rocks, plant and décor. 7) Secluded spaces: Secluded Garden Spots or garden rooms are a great way to build an outdoor sanctuary to escape the everyday stress of life. 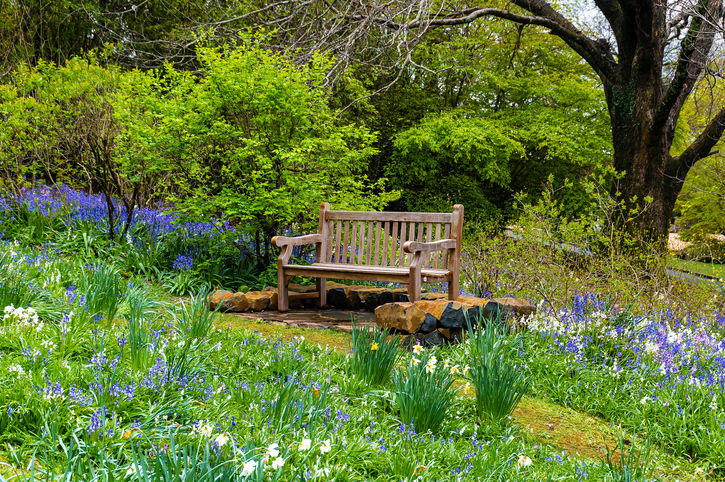 A quiet place to sit and ponder or read can be soothing and reinvigorating. 8) Creating a “staycation” spot: More and more families are creating an outdoor oasis in their backyard where they can enjoy each other’s company, nature and extend the square footage of their home. Creating outdoor kitchens, dining areas, recreation or living areas is a great way to have a place to staycation every weekend! 9) Making backyard structures focal points: The ambience of sharing a nice bottle of wine while relaxing outside with a roaring fire is one of the best ways to wind up a long day. Creating an outdoor space to focus on you is going to be one big trend going forward. 10) Making a notable first impression: The entrance to your home is the first and often the most lasting impression friends and family will get when visiting. Many homeowners are investing in landscaping combined with hardscaping to make that impression a good one. 11) Including unexpected elements in your arrangements: Get creative! A café table set next to a lily pond, a lighted stone bridge leading to a welcoming sitting area, a tall urn fountain – these unexpected features will wow visitors and sooth the soul. 12) Including food in landscapes of all sizes: When planning your landscaping, include plants that provide food, cover and water for wildlife. This will ensure a lively and thriving garden while providing much-needed habitat restoration. 13) Giving back with gardens: The ‘Giving Garden’ is trending as a way to give back to the community. Many organizations are encouraging the giving garden as a way to foster sustainable community values while making an immediate impact on food security. 14) Investing in furniture that lasts: Outdoor furniture is subject to many abusive natural elements, such as the sun’s rays, high winds, pelting rains and sleet. Many homeowners are looking for more durable and sustainable features in outdoor furniture, such as concrete, stainless steel, synthetic wicker or teak furniture, which is a dense, close-grained hardwood with a natural oil content that makes if resistant to the elements. 15) Pergolas: A pergola can provide protection from direct sunlight, yet allow air to circulate freely. This makes them a welcome respite from the harsh rays of the afternoon sun. Making a pergola the perfect feature of an outdoor living space. 16) Pink hues Pink promises to be the most popular hue in landscaping this year. Picture a lovely English garden on a sunny spring day. Expect to see a lot of pink hued knockout roses, delphinium, carnations, dogwoods, hydrangea, foxglove and petunias. 17) Metals: Metal landscape edging, corrugated metal sculptures or tall privacy screens are finding a niche in the landscapes of today. Metal is durable and weathers well, why hasn’t this become a ‘thing’ much sooner? Posted in attract wildlife, Delaware Landscaper, hardscaping design, new landscape, outdoor fireplaces, outdoor living space, patio designs, pergola, pergolas, sustainable garden and tagged beautiful patios, built in fire pits, Delaware Hardscaping Experts, hardscaping ideas, landscaping tips for Delaware, outdoor living space on January 22, 2019 by Denise Bernstein. Outdoor rooms that extend the living area of your home have become all the rage. Full kitchens, fire pits or fireplace with plenty of comfortable seating are perfect for evening garden parties or fun-filled family nights. Modern day living has evolved since the turn of the century. Many homeowners are looking to express their styles through creating outdoor living spaces that fit their lifestyle and extend their square footage of usable space. Imagine the kids lounging outside enjoying nature instead of cooped up in the basement or separate bedrooms playing video games. No matter what climate you live in, there are ways to make a comfortable and inviting outdoor living space to suit your family’s needs. Creating outdoor rooms into living areas, recreation areas, and more are a great way to bridge the interior and exterior of the home. There should be some real thought as to how to create a space that will work within your parameters and flow properly. One thing to avoid is haphazardly creating outdoor spaces casually without a real master plan. You’ll want to concentrate on functionality, as well as style. Look at the big picture and create goals and a plan for accomplishing those goals. One way to ensure success for the space and still maintain good design is by breaking the area into smaller rooms. Do not forget to take into account the effect of outdoor elements, since the climate will have a big role in how inviting your outdoor space turns out to be. Observe how the sun looks at different times of day and how the wind blows in different areas of the space to get a feel for your optimal arrangement of the space. Which Material is Best for Your Perfect Patio? Look at an outdoor kitchen the same way you would an indoor kitchen to make sure you create a workable space. Consider what kind cooking appliances and refrigeration units you will need. Determine how often you will be entertaining and typical size of your events. Think through the function and style of your cooking area. Take into consideration all the details such as landscaping, lighting, and materials. Lighting and landscaping are an excellent way to enhance a great pool or barbecue. While these are not expensive upgrades, they enhance an outdoor space and extend the value into the evening hours. Above all, hire a local design professional with a great reputation to create the space you really want. Even if it cost a little more, your outdoor space can be your stay-cation spot that is relaxing and rejuvenating – ALL in your own backyard. Want to extend your living area by creating an ideal outdoor spaces to meet your recreation and entertainment needs? Get in touch with DiSabatino Landscaping. 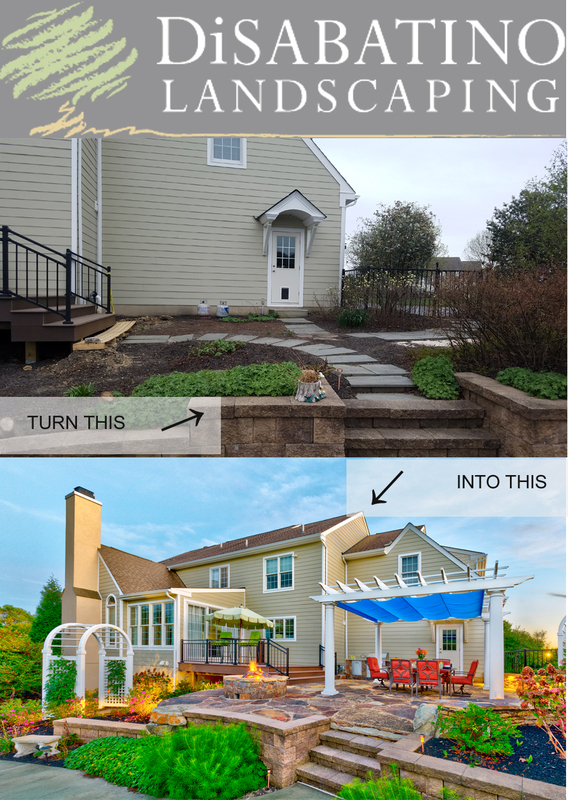 Posted in landscaping tips, outdoor living space, patio designs, pergola, pergolas, pool makeovers, rear porch, Uncategorized and tagged landscaping tips, landscaping tips for Delaware on August 28, 2018 by Denise Bernstein. Did You Know DiSabatino Landscaping Designs Beautiful Patios With Pergolas? DiSabatino Landscaping builds beautiful pergolas integrated expertly with custom designed patios and decks.A pergola can provide protection from direct sunlight, yet allow for air to circulate freely. This makes them a welcome respite from the harsh rays of the afternoon sun. Making them a perfect feature of an outdoor living space. Posted in hardscaping, hardscaping design, outdoor living space, patio designs, pergolas and tagged built in fire pits, hardscaping Delaware, outdoor living space, patios, pergolas on December 19, 2017 by Disabatino. Five Tips To Help Your Garden Grow!